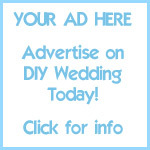 Wedding trends can be fabulous or frightful. Remember the year of the black wedding dress or the season of the pastel tuxedo? Yes, I try to forget them too, but my wedding photos keep reminding me that unfortunate trends can make looking back on your day a bit embarrassing. 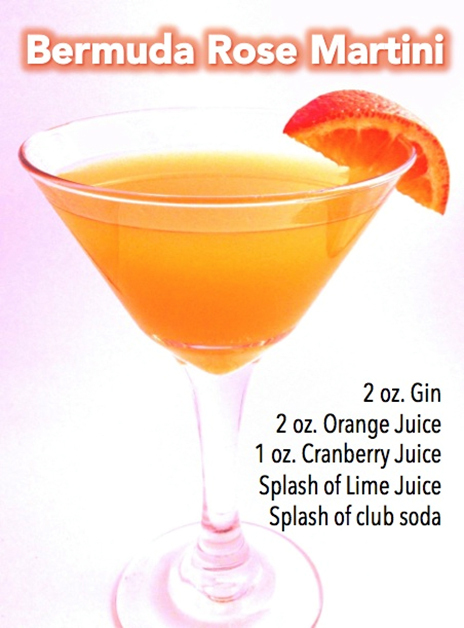 2013, though, is the year of a trend we can all appreciate, the signature cocktail. Why oh why didn’t someone come up with this idea a decade or so ago? Instead of stocking a full bar, which is incredibly expensive and annoying (especially when Aunt Shirley makes the bartenders mix her special “All You Can Drink” beverage that comes with a cherry-on-top, a separate pitcher of tequila with lime, and a whiskey chaser), the bride and groom can concoct a bright and fresh cocktail of their own. 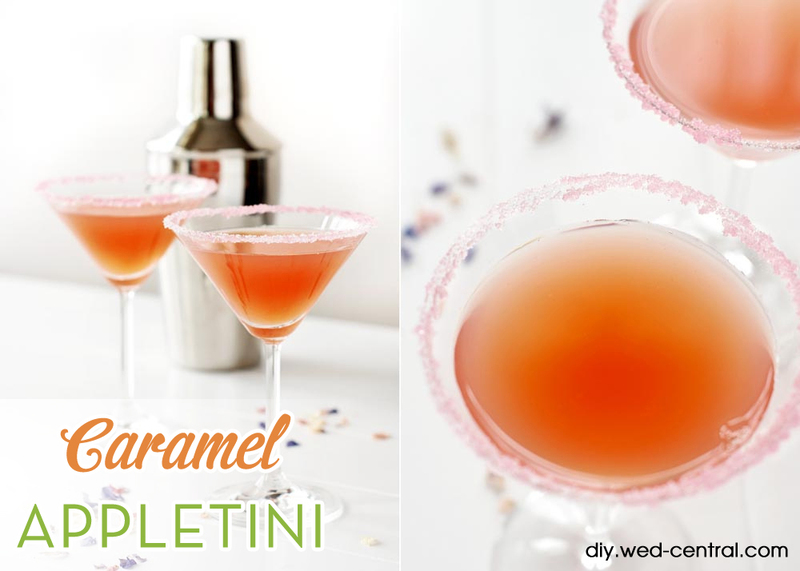 This drink can reflect the wedding’s theme and color and, best of all, will cost less than a full bar. I know “buying in bulk” is one of my favorite phrases, and whoever is paying for the wedding will be delighted with this new fad as well. Choosing the signature drink can be done at a pre-wedding party. The bride and groom can gather their friends and family, add vodka, gin, whiskey, scotch, etc., throw in some sweet liqueurs and juices, and voila’, the special cocktail is born. The best part is drinking all the mistakes and false starts. Designated drivers are a must for this gathering, but just observing the festivities will be reward enough for attending. At the end of this grueling exercise, something truly noteworthy will be created. 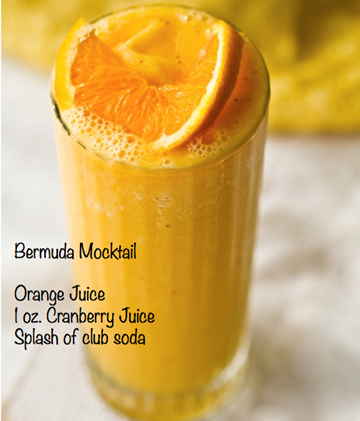 Here is a signature drink recipe that you can try at home. Developed by the event experts at the Turning Stone Resort, the Bermuda Rose Martini is a drink inspired by warm weather months of spring and summer. Known for their gorgeous landscape and bountiful amenities, the Turning Stone Resort is a popular Central New York wedding venue. Experiment with different recipes to find the best match for your wedding. This recipe can easily turned into a “mocktail”. Mocktails are delicious, and even kids can enjoy them. Also, the use of mock-tails at the reception lowers the chances of drunken brawls. Aunt Shirley might not appreciate the absence of alcohol, but she will survive. The reception will benefit from the happy couple’s unique beverage. The guests will be impressed by the novelty and delicious taste, and the money saved can be used for something special, like gifts the bridal pair registered for and didn’t get. Everyone wins, and this is one trend that won’t be embarrassing to remember ten or twenty years down the line. Signature cocktails are very trendy and popular in the wedding scene today. 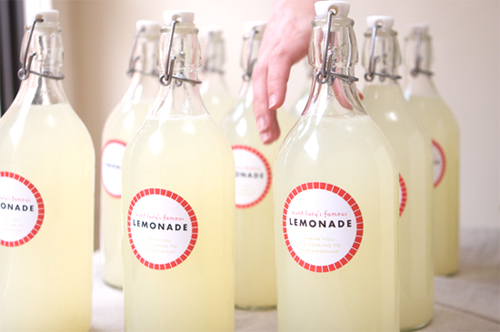 Some brides use them to further personalize their wedding day by creating a signature drink that reflects both the bride and the groom and the theme/feel of the wedding itself. Others like to incorporate signature cocktails into their bar when they have opted for a more affordable beer and wine bar, but want to add a little something special as a drink option for their guests. Since the holidays are fast approaching I thought I’d list a few recipe ideas for holiday signature cocktails for your holiday weddings! Set aside a night with your soon to be hubby to mix up these delicious treats and maybe you’ll choose one for the big day! (Maybe even serve a couple at your holiday gatherings this year!) If you like any of these recipes just give it to your bartender and he/she should be able to recreate it (over and over again!) for your celebrating guests. Mix all ingredients in a cocktail shaker with ice. 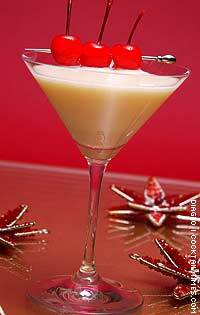 Strain into a chilled martini glass and garnish with maraschino cherries. Place 1/2 cup of simple syrup and 4 tablespoons of graham cracker crumbs on separate plates. 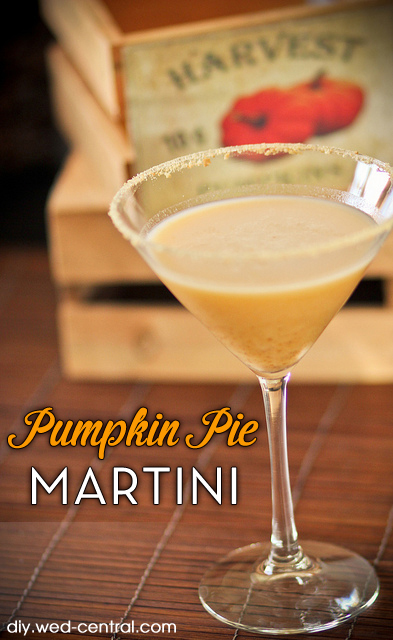 Dip outside rim of martini glass into simple syrup, then into graham cracker crumbs several times to ensure coverage. Set aside. 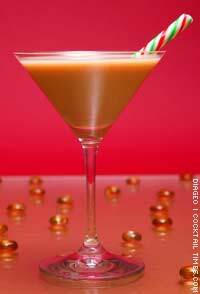 In a cocktail shaker, combine rum, gingerbread syrup, apple juice and lemon juice. Shake with ice in a cocktail shaker and strain into rimmed martini glass. 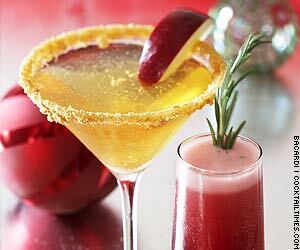 Garnish with red apple slice. Yum..they sound so delicious! 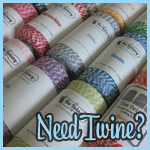 I may have to make a couple this weekend for my fiance and I..just a taste test! Hehee 🙂 If my wedding wasn’t a summer wedding these would be tempting additions for my big day. These would be best for you winter wedding brides though. Delish!